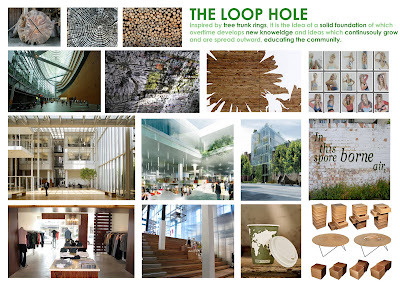 Well the brief for the project is to design a multifunctional space that can host different environmental groups (ie: Greenpeace, Friends of the Earth) where they can display their work and solutions on problems like climate change, fair trade and decreasing damage to our environment. 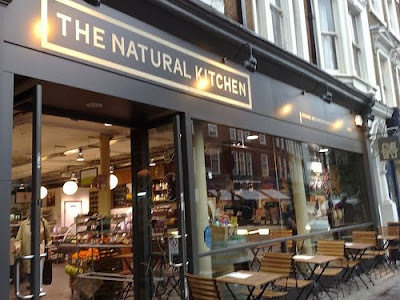 The building site for this project is just down the street and is the Natural Kitchen which is also a neat concept because it is a fresh grocery store but also serves as a restaurant. However for this project, the space will serve as a gallery, theater/conference room, restaurant, retail clothing store, cafe and rooftop terrace. The goal of the space is to attract people from off the streets in and to educate them about world issues and problems that these different organizations are dealing with and what we can do to help. 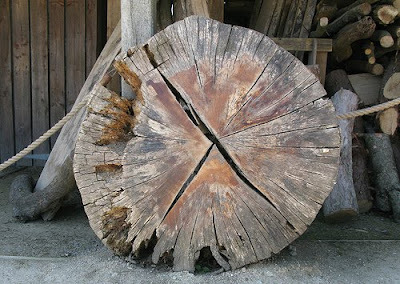 Here is my concept board of images that I researched and was inspired by...I am going off the idea of old tree trunks and how the growing rings spread and evolve (similar to how the organizations will grow and reach the community) year after year from sunlight and water (elements that will be in important in my space). I also found there is quite a bit of really neat sustainable clothing lines out there, the images I found are from goodone.com. Congratulations on your blog! It's very impressive....and I am not saying that just because I'm your dad! I love the name and theme. What a great way to keep us all current AND be learning more about digital marketing...it will def help you in your career. Jolly good!! !